What do you do when you can decide what color you want to wear? You wear ALL the colors! 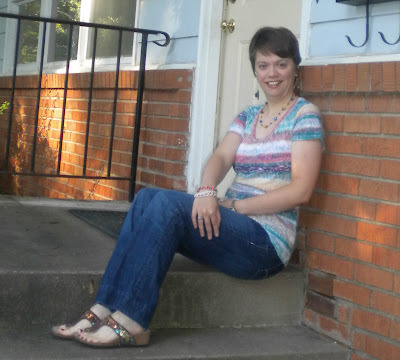 I love this colorful top I bought back in June when Maurices had a buy one, get one sale and I realized you all haven't seen it yet! I accessorized with some of my favorite multi-colored jewelry too, because it's Friday and why wouldn't you want to wear all the colors? You know what else is awesome? Wearing jeans! It was actually chilly outside this morning. I can't remember the last time I could say that!! I'm so loving this weather. I might even get to leave work a little early, though past experience says if I say that out loud it won't happen, but I'm going to be hopeful! It'll just be our little secret and then it will happen! I am pretty darn sure a patio will be calling our name tonight for dinner, even if it ends up just being our own backyard. The rest of the weekend is going to be a little busy, so I'm really looking forward to tonight for me and my Pants Monkey! I didn't get a chance to photograph my beer cellar last night to share with you all but I promise that is coming soon! Look, I even have on colorful shoes! I am just loving color today! Speaking of which, I love this song by Kira Willey called Colors. It's such a cute little song, maybe you've heard it before in a Dell commercial. Anyway, I found a fun video someone did with this song, so I will leave you with that and wish you a very happy weekend!! Loving your rainbow top! I think it's a perfect casual Friday look. I'm wearing jeans today too. There's nothing like a good old pair of comfy jeans :) I love that you paired everything with some colorful sandals...cute! Have a great weekend Beth! Yay! I love all of the colors! I wish I had time to take pics every morning, but my camera has to be a turnd right now. 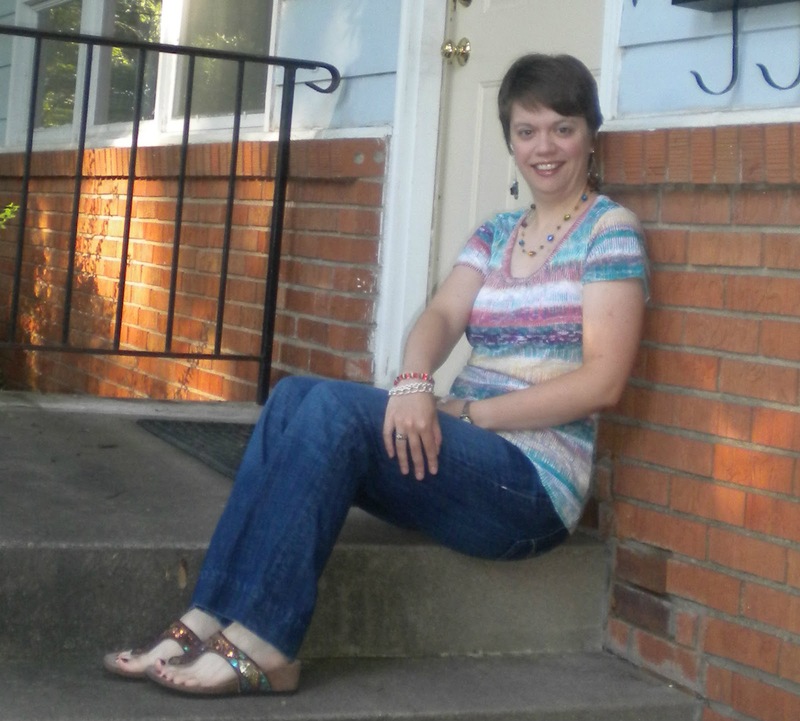 I am wearing jeans today too :) I live for cooler weather! Dinner in the backyard sounds awesome, I need to do that at least once this summer! The brightly striped top is so cute! I was able to wear jeans the other day, but now the crazy heat is back. Have a great weekend, Beth! I love how bright and cheery this outfit feels. That shirt is lovely. And yay for being able to wear jeans! I miss those mornings that it feels cold enough to wear long pants. Enjoy the weather and a fun weekend, Beth! Ooooooh, I LOVE those trouser jeans!!! I have been looking for a pair! 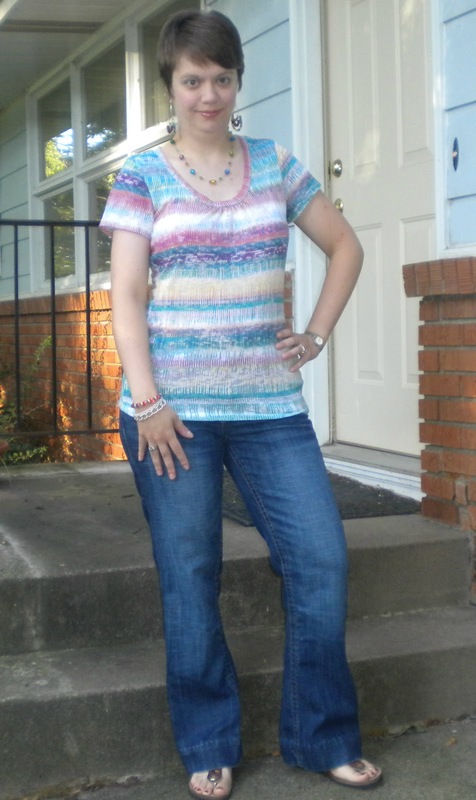 Man alive, I'd love to have some jeans on...and those trouser ones are my fav style :) Cutest rainbow top too, what a great sale find! Yay for sparkly shoes and jeans! Have a great weekend! I'm currently in your chilly city having lunch before conference madnes begins :) What a pretty colourful top- and want to check out that song later, love the eyeshadow! You're like Rainbow Brite! Love it. I'm wearing a lot of colours today too (post later tonight). Why not wear all the colours! I can't wait to see your Beer Cellar. I was gonna say what Sheila said, but she already said it :) You look happy and relaxed - hope your weekend is awesome. What color? All the colors! Cute tee and I love that you went for multi-colored accessories too. Wish it was chilly here. We got a ton of rain last night and today - like it didn't even happen. IT finally cooled down here in IL! but I am sure that it's not gonna last. and I wish it would! LOVE that top, Beth!